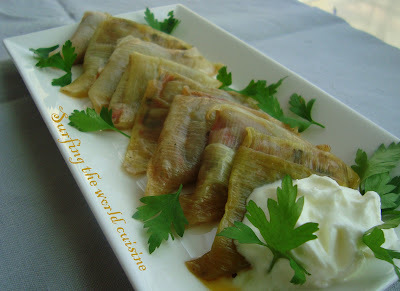 This is one of the recipes that I wouldn't normally try,but after seeing a photo in Turkish cookery magazine 'Sofra', I was very intrigued as it is a very interesting interpretation of Turkish classic - sarma ( stuffed grape leaves). It's delicious but I believe it's still tastier with grape leaves. It's quite easy to make, just if you need to make for the whole family, you'll have to buy a lot of leek as only the bigger outer layers are used. And what to do with the inner parts? It means you really have to plan ahead. 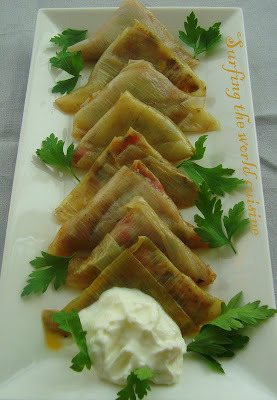 However, it's a great dish for those who have no access to grape leaves and still want to taste a bit of Turkey. 1. Cut in the leeks diagonally and remove 3-4 outer layers. Clean carefully. Then put in a big bowl or a pot and pour over some hot water. Let it stay there for about 5-7 minutes. 2. Mix rice, about 2 tbsp of olive oil, chopped garlic, tomato and red pepper, add the spices, some chopped parsley. Mix it well. 3. Take one layer of leek, add a teaspoon of stuffing and fold to make triangles. Fold it several times so that the stuffing wouldn't go out. 4. Put all the stuffed leeks into a pot. Cover with a plate ( you should press it a bit so when you add water, these stuffed triangles wouldn't loose its shape) and add water to cover the stuffed leeks. Season with salt and pepper, and boil for 15 minutes or until water is almost absorbed. Serve with yogurt. What a nice dish! Very pretty presentation! Jolita, this is a beautiful dish! The filling sounds quite interesting. Very beautiful and unique dish! Perfect party appetizer!